Die struck replica. Two posts with butterfly clips attached to the top bar. 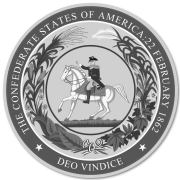 At their Annual Meeting, held in Richmond, Virginia, November 1899, the United Daughters of the Confederacy (UDC) approved a suitable design for a medal for Confederate Veterans. For some time the ladies were desirous of offering some sort of pin to their loved ones who served. Mrs. S. E. Gabbett of Atlanta, Georgia originated the design and offered it as a medal for veterans. As there were thousands of veterans and funds were limited it was agreed to produce the medal of copper (without the colored enameling) and each UDC Chapter would solicit candidates from their local United Confederate Veteran (UCV) Camps. Rules stipulated that no Cross of Honor could be bestowed upon a veteran without a Certified Statement from the UCV Camp attesting to the character and qualifications of the one on whom it was to be bestowed. The initial manufacture was 2,500 pieces and each UDC Chapter was to advise Mrs. Gabbett of the number of medals they required as she became the UDC Custodian of the medals. This was virtually the only token received by a Confederate Veteran thanking him for the service to his country. The following poem is from Confederate Veterans Magazine,Vol. XVI, No. 11, November 1908, Page 585. Are the thoughts of the days when all wore the gray! And scenes of the past live in battle array. is the little bronze cross he wears on his coat. A man who to honor and country was true. With love in our hearts for the comrade of old. The man who’d the right this bronze emblem to wear. Be the first to review “Confederate Cross of Honor Medal” Click here to cancel reply.